All Beehive Botanicals pollen is hand cleaned and dried without heat. Granules are the most natural method of securing the benefits of this energy powerhouse. Conveniently portioned in 500mg capsules, this product is easy to work into a busy lifestyle. Bee pollen contains all the essential components of life. The percentage of rejuvenating elements in bee pollen remarkably exceeds those present in brewer's yeast and wheat germ. Bee pollen corrects the deficient or unbalanced nutrition, common in the customs of our present-day civilization of consuming incomplete foods, often with added chemical ingredients, which expose us to physiological problems as various as they are numerous. Bee Pollen Grain improves heart function and prevents heart disorders. 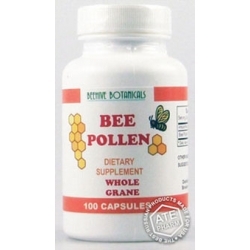 Bee Pollen due to its high bio-active effect is an excellent support for men's health! Pollen is considered an energy and nutritive tonic in Chinese medicine. Cultures throughout the world use it in a surprising number of applications: for improving endurance and vitality, extending longevity, aiding recovery from chronic illness, adding weight during convalescence, reducing cravings and addictions, regulating the intestines, building new blood, preventing infectious diseases such as the cold and flue (it has antibiotic type properties), and helping overcome retardation and other developmental problems in children. It is thought to protect against radiation and to have anti-cancer qualities.